Can I export my calendar to google or ical? First, open the "datebook" section of Pink Office by clicking "datebook" from the dashboard toolbar. 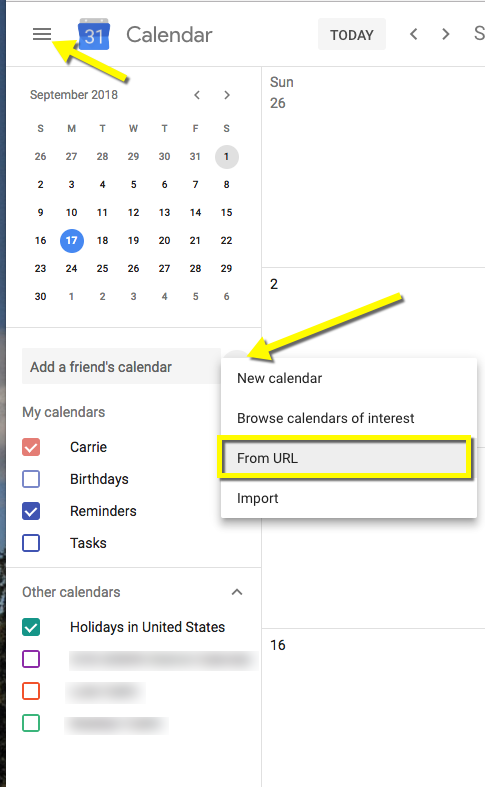 To Export to your Google Calendar click on "get export URL." From the Google Calendar app open the calendar settings by clicking the stacked lines next to the blue calendar icon. Then, click on the plus sign in the circle to the right of "add a friend's calendar" in Google Calendar. Then click on the choice "from URL." Paste the link you copied into the empty field and click "add calendar." Now, the bookings you have populated on your Pink Office calendar will appear on your Google Calendar. Next, click "Export to iCal." Click to open the iCal app in your dock and then click "OK" to add the event/s.